Australian golf fans will get their chance to congratulate and cheer on Curtis Luck as he continues to celebrate his recent US Amateur win. Luck, who became the first Australian since Nick Flanagan to win one of the world’s most prestigious amateur tournaments, has been invited to play in the Emirates Australian Open at Royal Sydney in November. 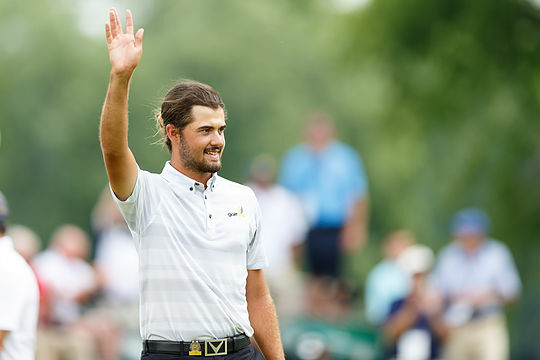 While fans will be flocking to catch the likes of world No 1 Jason Day as well as former champions Adam Scott and Jordan Spieth in action, they will also relish the opportunity to give Luck some attention too. The 20-year-old earned himself entry to the 2017 US Masters, US Open and British Open with his marvellous victory in Michigan. It also ensured he would postpone any plans to turn professional as he gets the chance to test himself against the world’s best without having to do any qualifying. “It’s my first Aussie Open and I’m obviously really excited because there are some big names coming down,” grinned Luck. “Hopefully I might make friends with a couple of them – I think Spieth has got the greens around Augusta down pat, so I might chat to him and get on his good side for a couple of tips, maybe. “It will be a real thrill to be at Royal Sydney and hopefully I’ll stand up to the test. Australian Open tournament director Trevor Herden was thrilled to invite Luck into the field. “We delight in having winners of the major championships in our national Open, so to have the champion of arguably the world’s greatest amateur tournament is a real highlight for us,” said Herden said. “We’ve watched Curtis come through the ranks and play five Interstate Series for WA and also finish runner-up at the 2014 Australian Amateur to reach this level, so we know he’s a player of exceptional talent. The 2016 Emirates Australian Open will be played at the storied Rose Bay layout from November 17-20.